Edited from a previous posting. These delightful triangle shaped filled goodies are cookie-like with a filling of jam or prune or even chocolate. 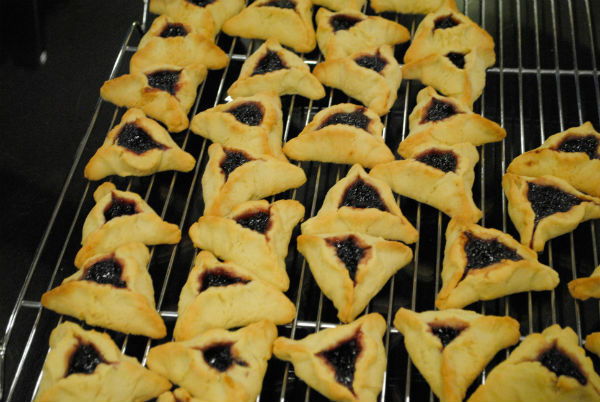 We eat Hamantashen traditionally for the Festival of Purim in March, which recounts the story of the heroic Queen Esther and her blessed uncle Mordicai. When my children were young, we all participated in the baking. Everyone received his or her piece of dough to roll out and fill. Although the results weren’t perfect, the kids loved eating theirs fresh from the oven. 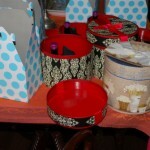 On Purim, it is traditional to make Purim Platicos or Mishloach Manot, which are typically baskets of sweets and goodies delivered to family and friends on the first day of Purim. 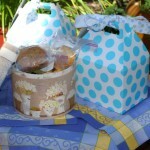 I always include hamantashen as one of items in the basket. 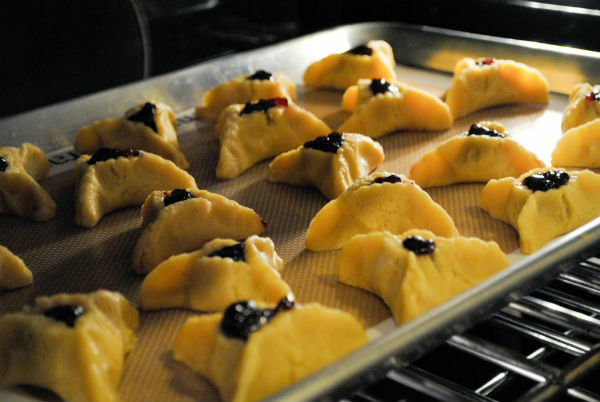 Hamantashen are fantastic with tea or coffee and occupy a special nostalgic place in everyone’s heart. 1 12 ounce jar of black cherry preserves or any flavor of preserves you prefer, such as red raspberry or apricot. 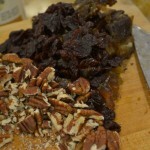 You could also make the usual lekvar or prune filling. Combine butter and sugar in bowl of mixer. Cream ingredients on medium speed until light and fluffy. Scrape down sides and bottom of bowl and mix for a couple more seconds. Add liquid ingredients, eggs, orange juice, vanilla, and almond to bowl and mix again, until creamy. Carefully add dry ingredients. Turn mixer on low speed to start and then mix for a moment on medium until a ball forms. Remove ball of dough from mixing bowl and roll it into a disc. 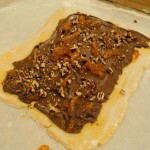 Wrap dough in plastic, and refrigerate dough for one hour or up to overnight. When ready to bake, heat oven to 350°F, remove dough from refrigerator and divide into two discs. 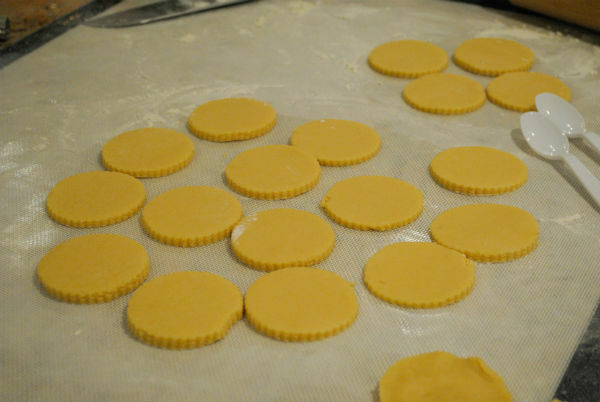 Dust the granite or wood or large silpat you are working on with flour and using a rolling pin, roll out first disc into a rectangle about 1/8 to 1/6 inch thick. Using a 3 inch biscuit cutter cut as many rounds out as possible. Work fast and with a light touch to keep dough from becoming too warm and soft. Reform left over dough and roll it out again with rolling pin to utilize the rest. 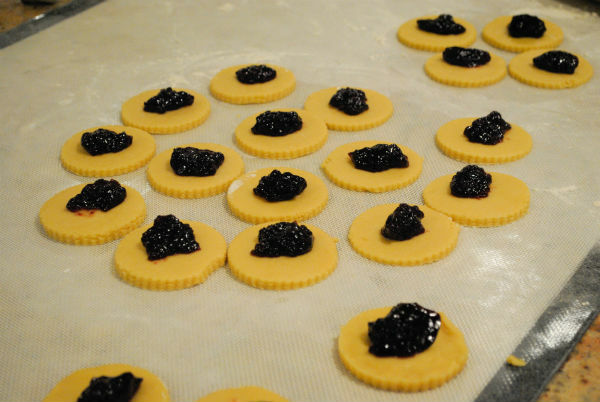 Place a small rounded teaspoon of jam or other filling in center of each round. Pinch dough circle up to form a triangle, leaving it a bit open in the center. Be careful not to let filling ooze out. Prepare 2 baking sheets, 12 x 18 inch size, with silpat liners or parchment paper liners. Place the formed triangles on sheet to accommodate as many as possible with out them touching as they expand a little during the baking process. Place filled pans, one at a time, on a rack in center of preheated oven. Bake until light golden color, around 20 minutes. Remove hamantashen from pan with a spatula and place them on cooling rack to keep bottoms crisp. Hamantashen should be stored in an airtight container when cool. 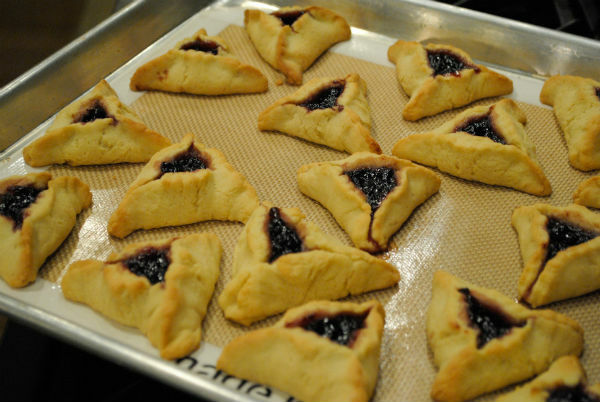 Hamantashen freeze well in an airtight container. Wishing you a very happy Purim! 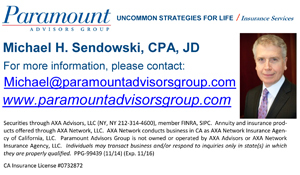 Just wanted to send a follow up thank you! Made them and they were delicious! I even blogged about it and gave you a shout out 🙂 thanks!! !